Put gluten free flour in a large bowl. Make well in center and add water and 5 eggs. With a fork beat eggs and water then gradually incorporate flour, mixing well. Batter will be thin, it is ok if you have some small lumps. Cook in small NON STICK PAN over medium heat. You should not need to grease the pan. Pour batter in pan (I use small soup ladle) quickly pick up pan and roll batter around to coat evenly…..it will be thin. I put the manicotti in several different glass pans as they must be in a single layer. I have used 13 X 9, 11 X 7 and even an 8 X 8. I use glass pans as I will make them a day ahead and refrigerate….or even freeze them for later. Put enough of your favorite sauce to coat the bottom of the pan. Now begin to fill and roll the manicotti and place them, single layer, in the pan. In the center of each manicotti (crepe/pancake) put about 2 tablespoons of filling. Pick up the front of the crepe and fold on top of the filling in the center and then fold over again. Place the manicotti in the pan (that has sauce in it) with the folded side down. Repeat until all the manicotti are filled. Cover with sauce, then sprinkle some grated Pecorino Cheese on top, cover with foil and bake at 350 for 20 minutes. If frozen you will need to bake longer or defrost in refrigerator and bake as listed above. Remove from oven and place on a wire rack, lift the foil and the sauce should be bubbling. 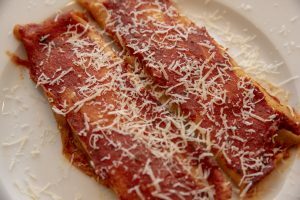 Sprinkle each manicotti with more of the finely shredded mozzarella and cover again. Just leave the pan on the counter until ready to serve. Enjoy these wonderful, light, tasty AND gluten free manicotti! No one will know they are gluten free!!! !